Improving technical properties and the durability of wood-based products by modification in various processing technologies is subject to recent research and development activities. This study aimed at integrating environmental considerations during the research and development phase of a novel modification process for a multilayer wood parquet. Due to expected challenges when applying Life Cycle Assessment (LCA) in this phase, the eco-profile of the modified multilayer wood parquet was referred to the original multilayer parquet by estimating payback period and identifying other payback options. An LCA was conducted during the research and development phase of the modification process at laboratory scale and is characterized as ex ante environmental screening of a newly developed technology. The environmental assessment of new products and manufacturing processes during the research and development phase, however, faces multifarious challenges, such as the definition of a functional unit and the service life length. In order to overcome these challenges, the idea was to answer the question under which circumstances the modification process pays back from the perspective of non-renewable energy use and global-warming potential. Aside from investigation of payback period, the feasibility of other payback options was systematically searched. The extra resource input and the resulting increase in environmental burden of the modification of the multilayer parquet can be justified with the extension of service life length by 10 to 20 %, referring to global warming potential and non-renewable energy use, respectively. Other payback options found were adjusting chemical loading during modification, making renovations superfluous, or reducing transport effort. Other than transportation and renovation, which are user-dependent, only the modification lies within the scope of the parquet producer. The payback concept is found suitable for comparative estimations on the magnitude of change in environmental performance of product variants during research and development. By investigating on multiple payback options, it was enabled to frame the change in environmental performance, which is essential in order to define the scope of further research and development in a target-oriented way. The possibility of using LCA for an environmental technology valuation at an early stage in product and process development is demonstrated in this study. The payback period usually describes the length of time required to recover the cost of an investment. This makes it a possible decision criterion, such as for engagement in product or process developments. Therefore, the years over which the cash flow is spread (not taking into account the time value of money) is of central meaning, starting from the year of initial investment until recouping of funds or the break-even point. In analogy to the economic reasoning, this concept is also used in the energy sector to estimate the energy payback period for the assessment of energy efficiency technologies. Energy payback is the point at which the energy investment given as the primary energy input for photovoltaics during its life cycle is compensated by its energy production output e.g., see studies for details: Lu and Yang (2010) and Peng et al. (2013). The concept of payback period allows one to consider different perspectives on the investment itself, which can be an initial purchase, maintenance, or an upgrade. The currency of payback considerations can be capital or energy, as already mentioned, but also environmental impacts. Using the idea of energy or the environmental payback period for analyzing investment alternatives earns special interest in the very resource-intensive building sector, which is responsible for the great part of society-induced environmental impacts. The environmental relevancy of the building sector has been illustrated in various studies from national/global material flow analyses (Behrens et al. 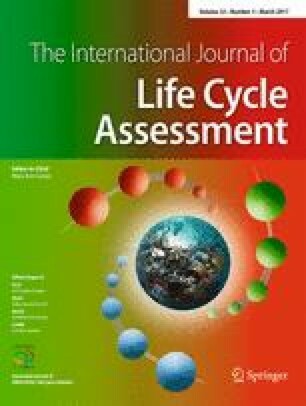 2007) to object-specific life cycle assessments (Buyle et al. 2013; Cabeza et al. 2014). Several authors (Cai and Aguilar 2013; Stern and Schwarzbauer 2013) describe that the awareness of consumers about the environmental friendliness of wood products has been rising in recent years, which leads to an increasing demand for environmentally sound products. However, the reputation of wood as being a sustainable material per se is not enough to declare the sustainability of wood-based products in general (Appelhanz et al. 2016; Osburg et al. 2016). Modification of wood-based materials and products by various processing technologies is subject to recent research and development activities (e.g., Hauptmann et al. 2014; Pleschberger et al. 2014; Weigl et al. 2012). In most cases, the modification of wood aims at improving durability (Kim 2013; Lekounougou and Kocaefe 2014) and technical properties (Xiao et al. 2012). In this case study, the concept of environmental payback period was considered for an environmental technology valuation of a novel modification process by comparing the environmental performance of the modified multilayer wood parquet to its original counterpart, using the well-established method of Life Cycle Assessment (LCA). The additional process for modifying the original multilayer parquet aimed at enhancing the functionality, considering hardness and fire resistance in order to develop new market segments such as offices or department stores. A streamlined LCA was conducted during the research and development phase at laboratory scale in advance of the transition to the pilot plant. In order to emphasize the application of streamlined LCA accompanying R&D, the term “ex ante LCA” is used. According to Roes and Patel (2011), this reflects on the initial stage of LCA model building, where, e.g., material formulation, production, and application are still being studied. An ex ante LCA can be used to identify the scope for further R&D activities (Roes and Patel 2011; Hesser 2015). The objective of this study was to integrate environmental considerations during the research and development phase of a novel modification process for a multilayer wood parquet in order to define the scope for further R&D activities. By modeling an ex ante LCA, it was quantified in which magnitude the modification of the multilayer parquet changes the environmental performance referring to the original multilayer parquet. Due to expected challenges when applying LCA in this phase, the eco-profiles were referred to each other by estimating payback period and identifying other payback options. The structure of research and presentation of this case study mainly follows the four-phase approach of LCA, as given by the ISO 14040 standard series (ISO 2006): goal and scope definitions in this chapter, inventory analysis in Sect. 3, and impact assessment and interpretation in Sects. 4 and 5. The streamlined LCA was conducted to estimate the changes in the original multilayer parquet’s eco-profile resulting from the modification. In the second step, it was the aim to answer the question under which circumstances the modification pays back from the environmental point of view. Aside from investigation of payback period, the feasibility of other payback options was also considered. While this study was in progress, the modification process (including the process parameters and the formulation of the chemicals) was still in the research and development stage on laboratory scale. This limited the definition of the functional unit to the covering of 1 m2 of ground rather than taking other functionalities—such as the targeted surface hardness and fire resistance—into account. The argument for using this functional unit is in line with several earlier flooring LCA studies (Günther and Langowski 1997; Jönsson 1999; Jönsson et al. 1997; Minne and Crittenden 2014; Nebel et al. 2006; Petersen and Solberg 2004). In 2011, a cradle-to-gate LCA of the original multilayer parquet was conducted on site (IBO 2011). That LCA is used as data basis within this study. It was planned to adjust all of the calculated environmental impact categories with the input from the modification; however, constraints in data availability limited the assessment to non-renewable energy use (NREU) and global warming potential within a time horizon of 100 years (GWP). Biogenic carbon was excluded by attributing it neutral. The modification of the original multilayer parquet is actually planned to be integrated as an additional processing step into the established multilayer parquet production line. Therefore, the modification module was modeled as an “add-on process.” To compare the modified multilayer parquet with the original parquet, a renovation module was modeled as an add-on process for the original multilayer parquet. The life cycles of the original and the modified multilayer parquets are modeled in order to produce an estimate of the payback period. In addition, other payback options that compensate for the extra resource input needed for the modification are modeled in the sense of a sensitivity analysis. The studied system and its boundaries are explained in the subsequent sections (Sects. 3.1–3.6). In the inventory step, all input and output flows of the studied system are collected. The data collected represents the life cycles of the original and the modified multilayer parquets from cradle to grave. Figure 1 illustrates the basic modules, which are equivalent for either life cycle: the production of the multilayer parquet (Sect. 3.1), its distribution from the factory gate to construction sites or handicraft businesses (Sect. 3.2), its use phase—represented only by the initial laying (Sect. 3.3)—and its end-of-life, comprising demolition and incineration (Sect. 3.4). To model the life cycle of the modified multilayer parquet, the module representing modification (Sect. 3.5) is added to the basic modules. To model the life cycle of the original multilayer parquet as counterpart of the modified multilayer parquet, the module representing renovation (Sect. 3.6) is added to the basic modules. As mentioned above, the existing cradle-to-gate LCA of the wood flooring production (IBO 2011) is used as the basis for the studied system. The cradle-to-gate LCA conducted by IBO (2011) comprises the processes from round wood production to production of the wood flooring (see Fig. 1 within the dotted line). The multilayer parquet studied represents a product mix of three types of rustic wooden floor boards up to 2.4 m in length, which are made from three layers, as defined in the German standard for multilayer parquet (DIN EN 13489:2003) (DIN 2003). The wear-and-tear layer is made of larch solid wood, which is varnished with natural oil for surface finish. The other layers are made of either solid wood, plywood, or other derived wood products. Table 1 shows some features of the original multilayer parquet. After its production, the multilayer parquet is packed (IBO 2011) and distributed by trailer trucks (25 t load capacity) to retailers or construction sites, mainly in Austria. The packaging of the original and of the modified multilayer parquets is identical. The mean distribution distance of 189 km was estimated by weighting the distances from the production site to the Austrian federal capitals by their inhabitants. The capacity level of the trailer truck was assumed to be 70 % with the transportation of the original and modified multilayer parquets. The weight increase of the parquet from 8.7 to 9.2 kg/m2 resulting from the chemical loading of the wear layer during modification leads to an increase of the capacity level of the trailer truck to 74.5 % when transporting the modified multilayer parquet. This change in fuel consumption is neglected because the difference does not affect the results. The use module mainly refers to the assumptions found in Nebel et al. (2006) and comprises the initial laying of 50 m2 flooring, which includes as a basic assumption the cumulative transportation distance of 102 km for the floorboards and the parquet layers from a handicraft business to a construction site. The vehicle assumed for transportation (see Table 2 for reference) has a load capacity of one t. The multilayer parquet is completely glued to the ground, which enables renovation by multiple sanding and surface treatments. The amount of 1.1 kg glue/m2 for laying was assumed referring to Nebel et al. (2006). After laying, the parquet producer recommends a surface finish with natural oil (1 l/70–100 m2). The inventory model was built assuming the use of 0.7 l/50 m2 of a naphtha based oil (95 %) with isoparaffinic hydrocarbons (5 %). The service life of the multilayer parquet is assumed to be 20 years, as in Nebel et al. (2006). The actual use and maintenance in terms of cleaning of the multilayer parquet are not included in the model, because the modification of the wear layer of the multilayer parquet does not affect the cleaning requirements, which also corresponds to Jönsson et al. (1997). In addition, Minne and Crittenden (2014) showed that differences in maintenance requirements are associated with the type of the flooring, differentiating among wood, ceramic, carpet, etc., and that the cleaning procedures such as sweeping and mopping that are common for wood floorings are negligible considering the life cycle. The renovation of the multilayer parquet is part of the use phase of the original multilayer parquet only. Therefore, the renovation is modeled in a separate “add on” module (Sect. 3.6) to the original multilayer parquet life cycle. For the end-of-life scenario, only incineration was considered for both parquet options, because the completely glued laying restricts secondary material use. No difference in process inputs for dismantling, transportation, and incineration of the two parquet options were made, because no obvious differences are expected at this stage of the development process, and referring to Nebel et al. (2006), it is assumed that the dismantling is done manually. For the inventory of waste wood transportation (100 km) and incineration, a generic dataset from the GEMIS database (IINAS 2013) is used. The incineration in a steam turbine power plant is modeled for waste wood categorized AI to AIV (this refers to the German ordinance on the management of waste wood; see BJV 2002). The original multilayer parquet as well as the modified multilayer parquet are categorized A II (glued, lacquered, coated wood, not treated with biocides). This means that the original as well as the modified multilayer parquets are modeled equally. The modification of the wear layer of the parquet is done on the production site and applied as an additional process (see Fig. 1). The wear layer of the parquet is modified through pressure impregnation of the wear layer in order to enhance surface hardness up to 40 % by applying siloxane and in order to enhance fire resistance by applying a flame retardant. Due to the modification, a weight gain of 20 % of the wear layer is observed, which results in a weight increase of 0.518 kg/m2. One square meter of the modified multilayer parquet has a mass of approximately 9.2 kg. The application of the modification substances is done by impregnation in an aqueous solution. This was done on laboratory scale, because the modification of the parquet was still in the research and development phase. In order to add the modification process to the production module, information on an industrial scale impregnation process had to be generated. This was done by estimating the average energy consumption of an impregnation plant, which is recommended by the producer of the flame retardant. Using the given plant specifications (WTT s.a.), an average energy consumption of 0.024 MJ for the modification of 1-m2 parquet was estimated. Following the impregnation process, the modified wear layer of the parquet needs to be dried. The energy used for drying is generated on site from the production wood residues. These residues sufficiently supply the increased drying energy demand of the whole production. No additional energy source is needed. This module is part of the life cycle of the original multilayer parquet. Renovation is included in the assessment because this process is the counterpart of the modification, distinguishing the original from the modified multilayer parquet. It depends on the user behavior how often wood floorings are actually renovated during their service lives. According to the standard for multilayered parquet DIN 13489 (DIN 2003), at least two renovations need to be considered in the design. That is the reason for assuming two renovations for the original multilayer parquet during its life cycle in this model as a basic assumption. The renovation module comprises the processes of transporting the parquet layers and their tools from a handicraft business to a construction site and back over a cumulative distance of 102 km (Nebel 2003), sanding down the floor surface assuming 0.43 MJ/m2 (Nebel 2003), and applying a natural-oil surface finish. The assumptions considering the transportation of the parquet layers to the construction site and the surface finish with natural oil correspond to the assumptions made for laying in the use module. This step translates the data collected in the life cycle inventory to potential environmental impacts of the studied system, using datasets mainly for transportation and electricity from GEMIS database (IINAS 2013), as shown in Table 2. The change of the eco-profile due to the modification process is illustrated by the input indicator NREU and the output indicator GWP. Section 4.1.1 answers the question of how long the service life has to be extended in order to pay back the extra resource inputs for the modification. Sections 4.1.2 to 4.1.5 assume equal service lives of 20 years for both floorings and answer the question of how the basic model assumptions have to be changed in order to compensate for the extra resource input for the modification. The life cycle of the original multilayer parquet is represented by adding the renovation module twice to the use phase. Two renovations are estimated to have 17.91 MJ/m2 NREU (Fig. 2) and 1.30 kg CO2e/m2 GWP (Fig. 3). The whole life cycle of the original multilayer parquet is estimated to be 148.37 MJ/m2 and 10.96 kg CO2e/m2. The life cycle of the modified multilayer parquet is represented by adding the modification module to the production phase. Note that no renovation is assumed for the life cycle of the multilayer parquet. The modification is estimated with 46.91 MJ/m2 NREU (Fig. 2) and 2.29 kg CO2e/m2 GWP (Fig. 3). The whole life cycle of the modified multilayer parquet is estimated to have 177.37 MJ/m2 NREU and 11.95 kg CO2e/m2. As explained in the goal and scope definitions, an environmental assessment on the basis of functionality—other that covering ground—is not possible at this stage of research and development because the precise material formulation, production, and application are still being studied. Therefore, the concept of payback period is applied in this study to grasp the magnitude of the change in eco-profile due to the modification process by investigating the break-even point where the modification is worthwhile on the basis of NREU and GWP. The payback period tells how long the service life of the modified multilayer parquet has to be extended in order to compensate for the extra inputs associated with the modification process. Aside from payback period, other options for paying back the extra input can also be modeled. Following the aim of having equal payback periods of 20 years for both floorings, the other parameters of the basic model assumptions (chemical loading during modification, renovations, transportation distances, floor area) are adjusted so that NREU and/or GWP values of the whole life cycle of both floorings are equal. In the following, these parameters are discussed as payback options. In this section, it is investigated whether the increase in environmental burden due to the modification can be paid back by extending the service life length of the modified multilayer parquet. So, under the basic assumptions, which suggest a service life of 20 years of the original multilayer parquet, the modified multilayer parquet needs an extended service life of 4 years benchmarking against NREU and 2 years considering GWP to compensate for the extra inputs of the modification (see Table 3). Extending the modified multilayer parquet’s service life to 24 years describes the scope for the succeeding R&D activities. In this section, it is investigated whether adjusting the level of chemical loading during the modification process can be a payback option. Recall that the basic assumptions suggest the modification process with 20 wt% loading of chemicals during the modification process of the modified multilayer parquet’s wear layer, which is compared against two renovations of the original multilayer parquet. Given the aim of having equal payback periods for both multilayered parquets (20 years), the level of chemical loading during the modification process is decreased to the level at which the NREU of the whole life cycles of both floorings are approximately equal. When assuming that the chemical loading is lowered from 20 to 8 wt%, the increase in environmental burden due to modification can be paid back within the same service life length, as illustrated in Table 4. The inventory analysis of the modification process revealed the inputs of electricity for impregnation and drying as fixed inputs because they are independent of the chemical loading of the wear layer during its modification. The chemical loading given by the percentage of weight gain of the wear layer is described as variable input. When linearity is assumed, the NREU increases by 11.59 MJ/m2/5 wt% chemical loading and the GWP increases by 0.56 kg CO2e/m2/5 wt% chemical loading, as shown in Table 5. In this section, it is investigated how many on-site renovations need to be made superfluous during the 20 years of service life of the original multilayer parquet in order to compensate for the extra input of the modification. Similar to the modification, the renovation can be described with fixed and variable inputs. The transportation distance is a variable input (elaborated on in the subsequent section). The electricity needed to sand down the original multilayer parquet, and the surface finish is described as a fixed input resulting in 1.41 MJ/m2 and 0.03 kg CO2e/m2. The electricity input for the sanders is modeled with an Austrian electricity mix (see Table 2 for reference) that assumes 60 % hydropower, 20 % gas, 9 % coal, 5 % waste incineration, 4 % wind, and 1 % oil. The sanding disks were not included in the inventory analysis (Nebel et al. 2006), which leads to an underestimation of the renovation module. The modification is paid back approximately in 20 years, when assuming that the modification makes five renovations superfluous (Table 4). The cumulative transportation distances assumed for laying (102 km) and renovation (2 × 102 km) can be described as variable inputs. Therefore, the transportation effort is introduced as a theoretical dimension that describes the relation of the cumulative transportation distance to the floor area laid, expressed as km/m2. It is investigated how an increase in transportation effort [km/m2] of the original multilayer parquet affects the payback of the modification. Under the basic assumptions, 50 m2 of modified multilayer parquet are transported to the construction site over a cumulative distance of 102 km, which equals a transportation effort of 2.04 km/m2. Due to transportation associated with the two renovations (2 × 102 km), the transportation effort of the original multilayer parquet is 6.12 km/m2 under the basic assumptions. The modification of the multilayer parquet is paid back when the cumulative distance to the construction site reaches a minimum of 260 km instead of 102 km. The transportation effort of the original multilayer parquet then is about 15.60 km/m2, which translates to 61.29 MJ/m2 NREU and 4.73 kg CO2e/m2 GWP. In contrast, the transportation effort of the modified multilayer parquet is 5.20 km/m2 (20.43 MJ/m2 NREU and 1.58 kg CO2e/m2 GWP) because the transportation associated with the two assumed renovations becomes superfluous. The radius of 260 km is the minimum distance that has to be covered for the modified multilayer parquet to become environmentally advantageous compared to the original multilayer parquet. The cumulative transportation distance associated with the renovation of the original multilayer parquet is crucial considering its influence on payback of the extra input for the modification. In this section, it is investigated whether the floor area is subject to being a payback option. The basic assumption of 102 km transportation distances per renovation for a floor area of 50 m2 describes a transportation effort of 6.12 km/m2. By assuming a floor area of 20 m2 instead of 50 m2 at same transportation distances, the “payback ratio” of 15.60 km/m2 is created (mentioned above in Sect. 4.1.4). With a floor area of approximately 20 m2, the modification pays back within the equivalent service life length of 20 years. The decrease of floor area is a payback option for the modified multilayer parquet in this model, because the environmental burdens of a fixed transportation distance connected to the renovation of the original multilayer parquet is allocated to the floor area and the functional unit of 1 m2. The transportation effort increases for smaller floor areas, when comparing the original to the modified multilayer parquet, and avoiding transportation pays back the extra resource input for the modification. The objective of this study was to integrate environmental considerations during the research and development phase of a novel modification process for a multilayer wood parquet in order to define the scope for further R&D activities. By modeling an ex ante LCA and estimating the payback options, it was quantified in which magnitude the modification of the multilayer parquet changes the environmental performance referring to the original multilayer parquet. The input indicator NREU and the output indicator GWP were quantified in a streamlined LCA, which was characterized as an ex ante LCA to emphasize the R&D stage of the product system. It was found that the difference in NREU of the modified and the original multilayer parquets is higher in relation to the difference in GWP. This makes the NREU the more critical indicator. The NREU value is expected to further increase with the subsequent iteration of the LCA model, because the NREU value of the glue for laying was not yet specified. In addition, additive chemicals used for the modification were not yet inventoried. The chemicals used for the modification were approximated by modeling the main input of siloxane. The lack or restrictions in availability of full inventory data, especially for intermediates, such as the detailed composition of chemicals, are a challenge in ex ante LCA and subject to refinement of the model. The extra resource input and the resulting increase in environmental burden of the modification of the multilayer parquet can be justified with the extension of service life. Providing estimation on the magnitude of extension of service life by 10 to 20 % referring to GWP and NREU, respectively, enables informed decision making considering further research and development in this field. The sensitivity of the payback period considering the modification inputs were tested by increasing the used NREU and GWP values of the modification inputs by 25/50/100 %. The payback periods then are 26/28/32 years considering NREU and 23/24/26 years considering GWP. With the LCA information, the balance between chemical loadings during modification, which corresponds to functionality and service life requirements, can be determined, and environmental burdens can potentially be reduced. The screening LCA and the observation that the hardness of the wear layer can be increased by 40 % with a chemical loading of 20 % are the starting points for further improvement in R&D. To date, however, it is not yet clear to which extent or at which level of precision the multilayer parquet can be modified to tailor the requested properties. For this reason and the question of consumer behavior, the functional unit of 1 m2 was applied as an approximation, although the two flooring options are not simply comparable on area because they perform different functional requirements. The comparison on basis of area in this streamlined study represents the least common denominator. Furthermore, the justification of environmental impacts through service life can be criticized as weak argument because the manufacturer has no influence on user behavior. A retrospective LCA that uses actual data on use phase and service life is most likely to draw other conclusions. Such a study, however, was not found during the literature review. Although the service lifetime of a flooring affects the total environmental impact (Jönsson et al. 1997), the question of lifetime remains subject to assumptions (Aktas and Bilec 2012; Günther and Langowski 1997; Jönsson 1999; Minne and Crittenden 2014; Nebel et al. 2006; Petersen and Solberg 2004). Hence, other payback options were identified within this study in the sense of a sensitivity analysis. This was done by assuming an equivalent service life of 20 years for the modified and the original multilayer parquets. Then, the reduction of chemical loading to a level of 8 wt%—assuming a linear relation of resource input to percentage of fixed chemicals—justifies the modification, under the condition that two renovations are made superfluous. To date, however, it is not clear whether the assumption of linearity is valid and to what extent the lower level of chemical loading changes the parquet properties. Considering a chemical loading of 20 wt%, five renovations would need to be made superfluous. With a service life of 20 years, five renovations are equal to a renovation interval of 4 years. This is rated critically because the wear layer of the original multilayer parquet is designed for at least two renovations, referring to the standard for multilayered parquet DIN 13489 (DIN 2003), but it is not investigated in this study what the maximum number of renovations actually is. The laying of a new original multilayer parquet in case no further renovation is possible after the second renovation was not considered in this comparative study. It was found that the resource input for sanding down and surface finish as core processes of the renovation contributes only marginally (NREU 11 %, GWP 5 %) to the environmental impact of this module. The sanding disks were not included in this streamlined model, which underestimates the renovation module. Estimating the sanding disks’ contribution to the renovation can be subject to further iteration. The transportation distance of the floorboards and the parquet layers from a handicraft business to a construction site is crucial when comparing the multilayer parquets. It was found that an increase in transportation effort per square meter of the original multilayer parquet related to the modified multilayer parquet justifies the modification. The transportation effort per square meter can be modeled by increasing the transportation distance of the construction site or by decreasing the floor area. This means that the modification is justified by making transportation superfluous. Note that the basic assumption on transportation distance was taken from Nebel et al. (2006), which represents a German context. The streamlined LCA was conducted to initially grasp the changes in the original multilayer parquet’s eco-profile due to the modification. This study is characterized as an ex ante environmental screening of a newly developed wood properties improving technology. This study aimed at answering the question under which circumstances the modification pays back from an environmental point of view to guide further R&D activities. Aside from investigation of payback period, other payback options were also identified. The concept of payback period is found to be suitable to comparatively estimate the magnitude of change in potential environmental impacts of product variants by framing options for further research and development activities. The investigation of payback options in addition to payback period enables to frame the change in potential environmental impacts, which helps to define the scope for further research and development in a target-oriented way. This demonstrates the possibility of using LCA for an environmental technology valuation at an early stage in product and process development. The tailoring of product properties, such as adjusting the modification to a required function, enables optimizing resource inputs in manufacturing by avoiding over engineering and therefore is a key payback option (Hesser 2015). This opportunity can be directly targeted in further research and development activities of the modification process. Renovation intervals and transportation effort are other payback options identified, but they represent structural problems rather in the scope of consumers. It is suggested to build the decision about which properties should be modified to what extent on further research such as consumer demand and behavior or market analysis. The application of the payback concept in ex ante LCA can support the reduction of environmental burdens of a product by developing consumer-oriented optimization of functionality. Open access funding provided by University of Natural Resources and Life Sciences Vienna (BOKU). This work was supported by the Austrian Research Promotion Agency (FFG) under the COMET program.